Japanese electronics giant NEC is using thermal scanners at their company HQ to look for flu carriers. 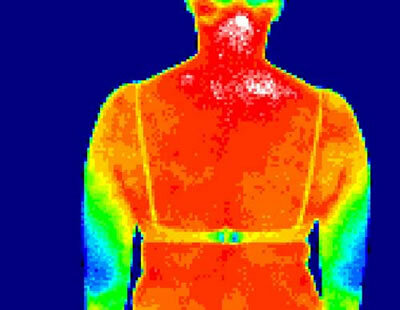 The infrared thermography system shown above produces a visualization of the body, with the warmest areas - above thirty-eight degrees Celsius - in red. If you're in the red, the ever-vigilant flu patrol will swoop down on you with thermometers for insertion.